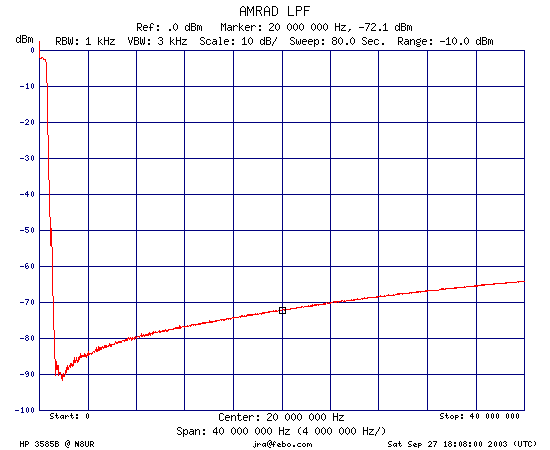 AMRAD has done a lot of work with low frequency reception, and I am using one of their active low frequency antennas. The antenna works well, but I have a couple of local AM stations that put quite a hefty signal into the antenna, and any receiver that is hooked up to it -- the power at the antenna connector is about -3dBm during the day, and increases to 0dBm at night. If you don't believe me, here are some pictures worth a thousand words. 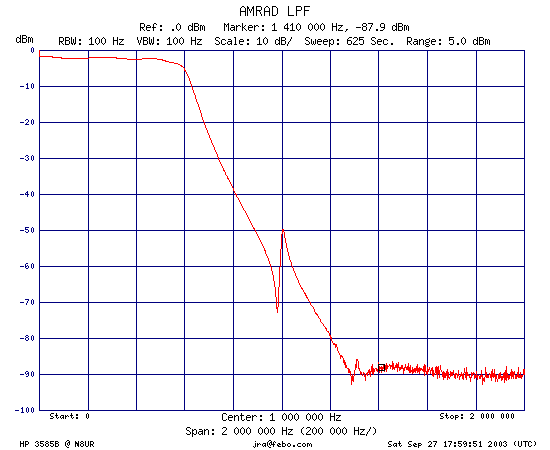 Frank, K0BRA, published an article describing the AMRAD low frequency upconverter in the April, 2002 issue of QST Magazine. That project includes a low pass filter that's designed to knock signals above 500kHz down to size. The filter has two components: a seven-pole low pass filter, and three sections of tunable notch filters that can be used on particularly strong signals. Cleverly, Frank designed the project so the LPF is on a separate circuit board and you don't have to build the whole converter to take advantage of the LPF. FAR Circuits has PC boards for the upconverter available, and was willing to sell me just the LPF board for $4.00 plus shipping. I've built and installed the low pass filter, and it has solved the problem my Austron LORAN-C receiver had with overload from the local AM stations. This page shows the results I obtained when I measured the filter's performance with my spectrum analyzer and tracking generator. I initially built and tested just the low pass filter section, and here are the results. This is the insertion loss shown at 1dB/division from 10Hz through 500kHz. Next, I added the three notch filter sections to the filter. I had to experiment with the capacitance values to put the notches where I needed them; the tuning range of the variable inductors is only a couple of hundred kilohertz. Note that these shots were taken with the filter outside its box. The nominal input level was 0dBm. 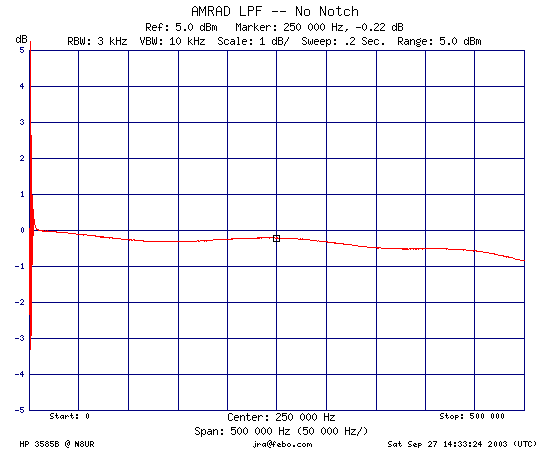 Also note the anti-resonance at about 1005kHz. Fortunately there aren't any local stations right at that spot. 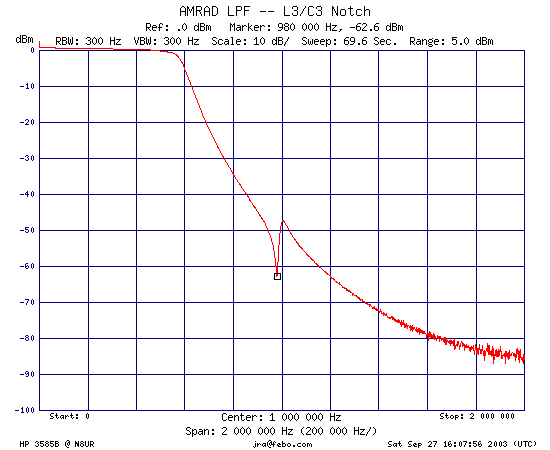 I wired the L2/C2 notch to resonate at 1290kHz, the middle (and weakest) of the three major signals. To get there, I used a 0.0027uF cap in series with a 0.0039uF. 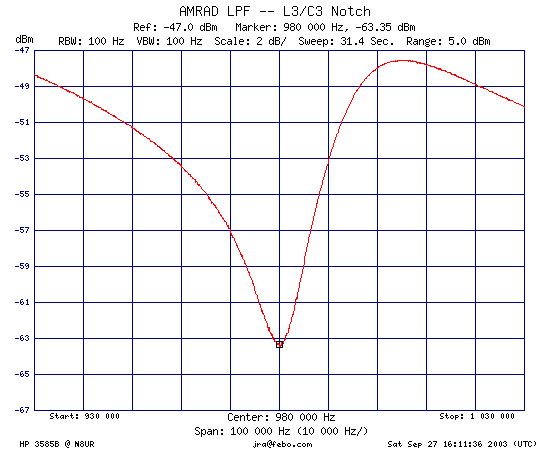 The L1/C1 filter is a parallel resonant trap, with a smaller inductor. I configured it for the 1410kHz signal, which is the strongest here but is also the furthest down the response curve of the LPF. To get there, I used a 0.015uF cap. I could tune L1/C1 to put the 1410kHz signal over 100dB down, but rather than doing that I adjusted it to smooth out the peak above the 1290kHz notch. I figured that 1410 was already far enough down and it didn't need the additional notch. After installing all three notch filters and packaging the thing up in a Hammond diecast box, here are the final results. This is the full 0 to 40MHz sweep. This is the more interesting 0 to 2Mhz range. This is the insertion loss from 0 to 500kHz. 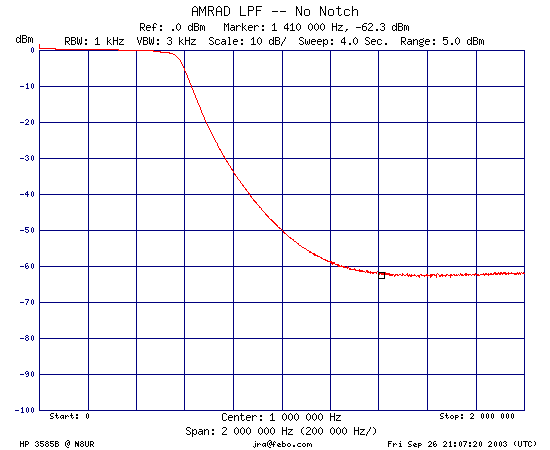 Note that the insertion loss is greater than in the LPF-only traces, and is around 3dB. This is because I've now added the series input resistor (33 ohms) that I didn't include earlier. This resistor provides a better match to the source for out-of-band energy and thereby helps reduce possible IMD problems. 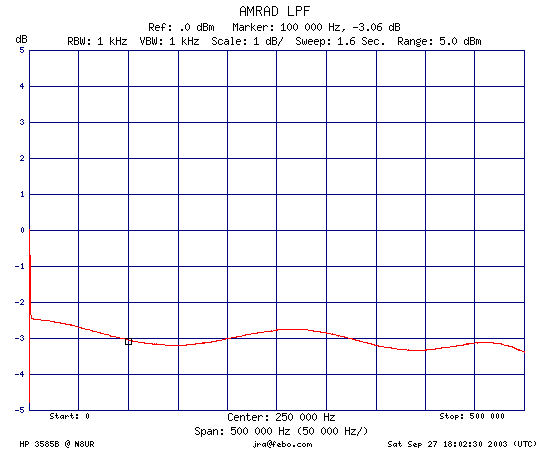 As a measure of how much this filter helps in my situation, the AMRAD active LF antenna delivers about -6dBm of (daytime) power at the output of its two-way splitter (that means the actual single-port power level is 3dB above that). With the filter inserted, the power level drops to about -38dBm, which ought to make any receiver quite a bit happier.